Chat Kaew. One of the popular villages located between Soi Nernplabwan and Soi Khao Noi and surrounded by all amenities in that area. 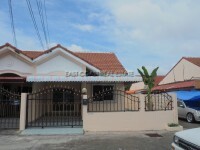 This semi-detached townhouse has 2 bedrooms and 2 bathrooms. It is unfurnished so very convenient for those who want to decorate their own accommodation. Title deed is in Thai name. Available for rent with a minimum of a 12 month contract only.